Everybody love their dog and do not even mind to give it a bath, but then the drying of a dog or one of our other furry friends is nobodies favorite part. We have found that the Metro Air Force Commander does a great job in drying a dogs hair compared to other products. This is why we think that! This dryer is developed specific for dogs and other animals. There is no heating element in it, because this will make it to hot for your dog and turn it into a normal hair dryer like we humans use. The purpose of the Air Force is to force the water out of the fair with air and not dry it like a normal hair dryer. That is why it comes wit an airflow that is much higher. This will dry your dog quick and safe because the only heat comes from the motor and will not make the air to hot for your dogs. Compared to the Metro Air Force 1.3 HP dryer the variable speed is a big pro. Like always we like to look at the bad reviews to see if we should even recommend this product and to see if we find thing that are mentioned a lot. For example we found a review that gave a one star and when we read it this was just because his dog did not like it and he send it back. In my opinion this had nothing to do with the product review. 92% of the reviews we have read give this dog dryer a 4 or 5 star rating. The variable speed was mentioned many times as a big pro because you can use it on different size dogs and just adjust the speed to the settings every dog needs. Some dogs do not like the noise to much, but it seems to help to turn it on before you star using it and let them get used to the noise and not associated it with the drying of their fur. Some people use it to dry their motorcycle with it after washing it. You can dial down the speed when you are ready to do the dogs ears and they will like it better than having it blown full force in their ear. This dog dryer is made in America and made of steel instead of the usual plastic. All parts can be bought and replaced. In my opinion this is a big plus for all dog and pet lovers. The fact that you can buy it in 3 versions and 5 colors makes it even easier to find the one you like. Depending on your dog size and fur type you can choose one of the low or higher HP versions. 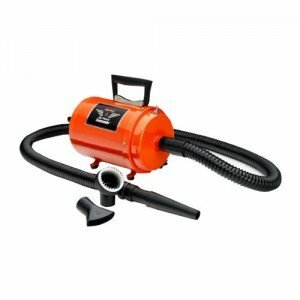 The variable speed gets a lot of great comments and therefore is a also a nice feature that most other dog dryers do not have. 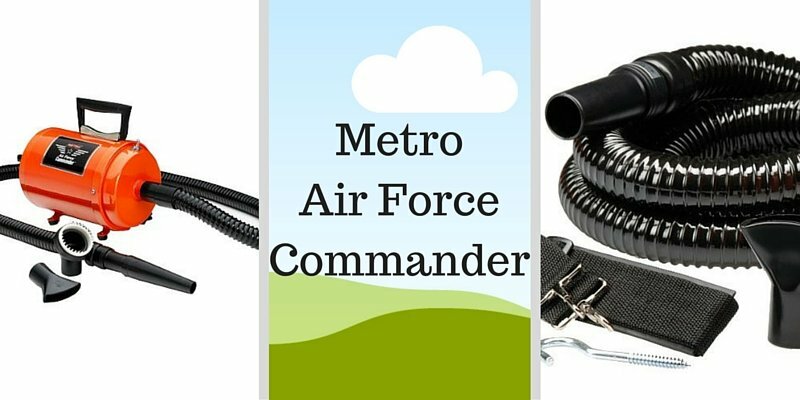 All together we can recommend this Metro Air Force Commander as a good buy. The price is a little steep, but it is worth every penny and reviewers mentioned many times that they have used it for many years with no problems. You can see all our professional dog hair dryer reviews here.